All the King’s Men (1949): Written and directed by Robert Rossen. Based upon the novel of the same name by Robert Penn Warren. Starring: Broderick Crawford, John Ireland, Joanne Dru, John Derek, and Mercedes McCambridge. Unrated. Running time: 110 minutes. 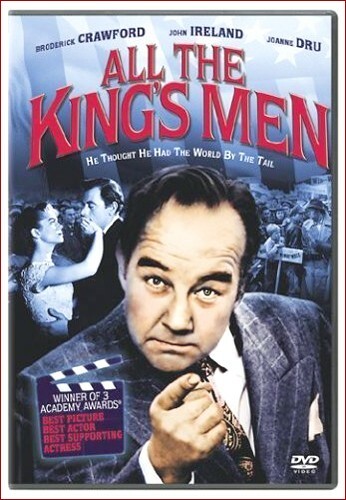 With the fanfare received by Robert Penn Warren’s novel and the obvious allusion to the late governor Huey Long, it was inevitable that All the King’s Men would receive a film adaptation. The story of Willie Stark (through the eyes of a young reporter) reinforced a popular trend in the movies: the rise and fall of seemingly decent people. A self-described “hick,” Willie Stark seems to embody the values of the “common man”—at least at first. But underneath his humble veneer, Stark hides a vindictive streak. As he appeals to the masses of an unspecified state, Willie becomes as corrupt as the politicians he rages against. As a political exposé, All the King’s Men isn’t necessarily ground-breaking—but as a character study, it’s very convincing. The transformation of Stark from country bumpkin to power-monger is made even more believable by Broderick Crawford’s ability to slide in and out of both personas. We see firsthand the intrigues of Stark’s political machine: the bribes, the underhanded deals, the police force that functions as a Gestapo. Even as the film threatens to over-sensationalize itself, it always remains interesting. Rossen’s screenplay stresses the political cynicism that later films like The Candidate and In the Loop would adopt—where corruption is so prevalent as to become an accepted way of life. And there’s a genuine tragedy in the form of Willie Stark, whose noble intentions (at first) give way to a sense of entitlement when pushed too far by the powers that be. While the film does drift into exaggeration (particularly the over-reliance on montage), it remains relevant even today, as political arguments and self-righteous anger often tread common ground. It serves as a firm reminder that corruption exists both in the political sphere and within the human heart.